If you haven’t made a quiche with a sweet potato crust, it’s time to give it a try! 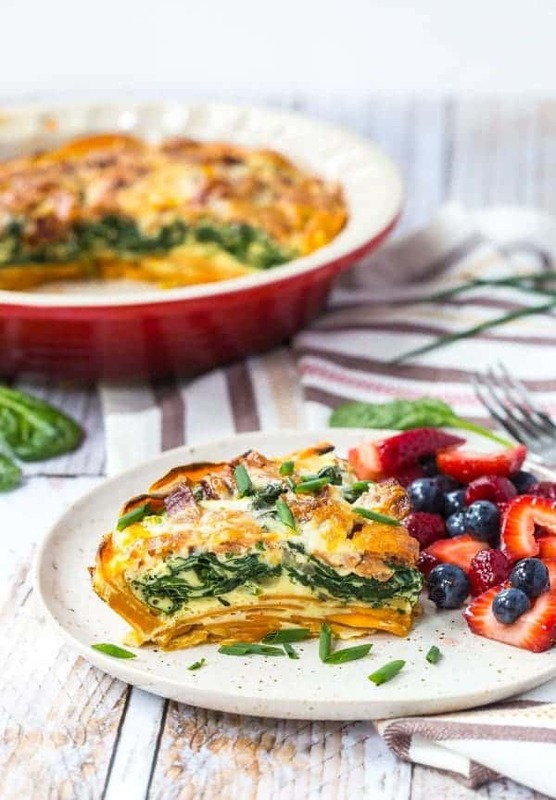 This bacon cheddar quiche is a healthier alternative to a traditional quiche, plus it packs more flavor. You guys know I’m pretty loyal to my mom’s cornmeal crust when it comes to quiche. The crispy texture of it is perfect for a rich quiche. But sometimes I do stray from the usual and try something new. I’ve been seeing the idea of a sweet potato crust floating around Facebook and the internet and I knew I had to try it. I loved the idea of a healthier version of quiche, plus I adore the flavor of sweet potatoes. And dare I say, it’s easier than making a traditional crust? If you don’t have a mandoline, it will be slightly more time consuming, but it’s pretty forgiving. (But PS, buy a mandoline. It’s such a great tool to have in your kitchen!) Cooking Light has a great video that shows the general technique for putting this crust together – but like I mentioned, it’s pretty easy and quite forgiving. Once you pour the quiche egg mixture in, the eggs act as glue and hold the crust together nicely. I chose to keep the flavors of this bacon cheddar quiche pretty classic to let everything shine. 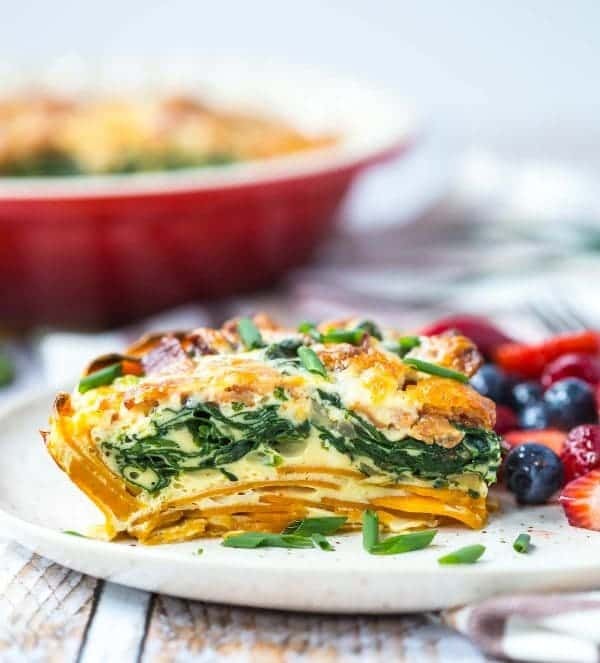 It reminds me a bit of my egg white breakfast bake, with the sweet potatoes and spinach. This time I included salty bacon and rich sharp cheddar cheese. I sprinkled the cheese on top and it forms a great upper crust to the quiche (if I’m being honest, it was my favorite part). PS: I garnished with fresh chives because my chive plant is already out of control, but they are totally optional. PPS: If you’re looking for more breakfast and brunch ideas, you can find tons in my breakfast archives or on Milk Means More’s website. 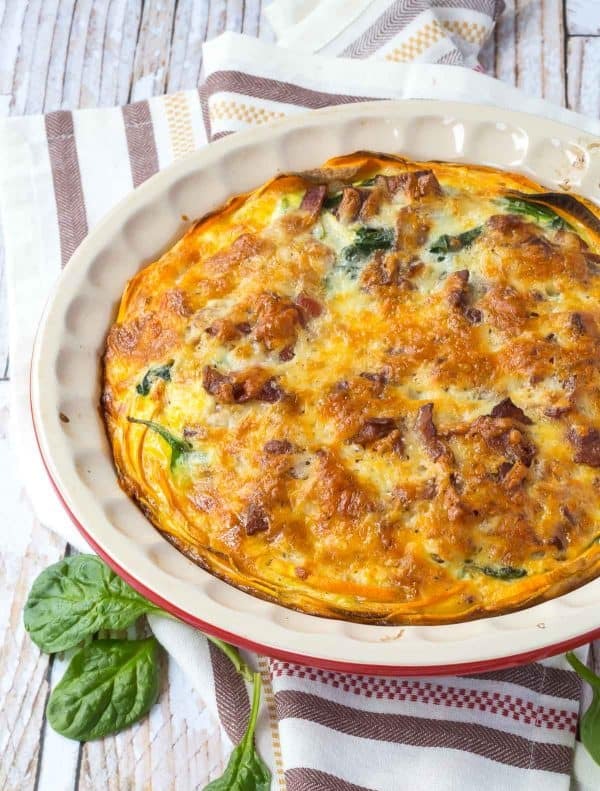 Watch this short video to see how to make this Bacon Cheddar Quiche! If you haven’t made a quiche with a sweet potato crust, it’s time to give it a try! 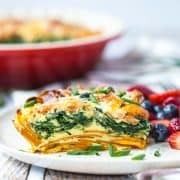 This bacon cheddar quiche is a healthier alternative to a traditional quiche, plus it packs more flavor! Spray a 9-inch pie plate with nonstick cooking spray. Peel sweet potatoes and slice very thinly – using a mandoline if possible. Layer sweet potatoes into pie plate, overlapping to completely cover the bottom of the pie plate. 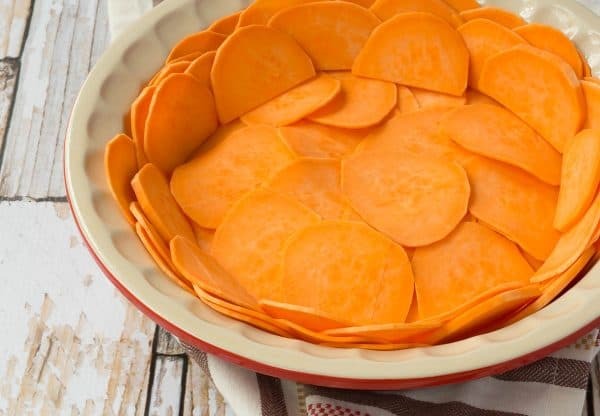 To create side of crust, trim the sweet potato slices so they are flat on one side and continue to line the edges of the pie plate, overlapping slices. Continue this process until the pie plate is completely covered (you want it 5-7 layers thick). Spray again with nonstick cooking spray or olive oil spray. Bake sweet potato crust for 20 minutes at 350 degrees Fahrenheit. Meanwhile, fry bacon pieces in a large skillet over medium heat until browned and crispy. Remove bacon pieces to a paper towel lined plate, reserving 1 tablespoon of bacon grease in pan. Keeping heat on medium, add onion to bacon grease and cook until translucent. Add spinach, cover for 1-2 minutes, and then stir until spinach is wilted. Whisk eggs and milk in a bowl with salt and pepper until combined. When crust is pre-baked, remove from oven, increase oven temperature to 400 degrees Fahrenheit. 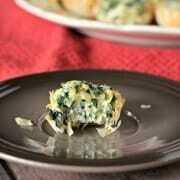 Carefully fill crust with spinach mixture. Sprinkle bacon on top of spinach and cheese on top of the bacon. Pour egg mixture over spinach, bacon and cheese. If you have too much egg mixture, discard (this will depend on the size of your pie plate and how deep you made your crust). Bake at 400 degrees Fahrenheit for 25 minutes or until eggs are set in the middle. Cool slightly (5 minutes) before slicing and serving. Verdict: I loved this bacon cheddar quiche. The sweetness of the sweet potatoes was the perfect complement to the salty bacon and flavorful cheddar cheese. Husband’s take: Honestly, I’m not sure he’s tried this yet! I think I devoured it all for lunches and breakfasts. Sorry Ben. Changes I would make: None are necessary but I can’t wait to fill sweet potato crusts with all sorts of fillings. This was fantastic! I own/run a B&B on the Eastern Shore of Maryland and I know my guests are truly going to enjoy this. What was nice was also that even when I had a guest that didn’t eat bacon, I was able to leave the bacon off one side of the dish and it kept/worked well :) One question for you: have you tried making the crust ahead of time? Just looking for time-saver steps. Perhaps cut/prep the crust but not bake it if baking it isn’t going to work doing the day before? This is definitely a big hit here at the Inn – thanks for sharing! So happy to hear you liked it! Bonus is that it’s gluten-free, too! I have not tried making the curst ahead of time…let me know if you give it a go! Made this tonight with some sausage, spinach, onion and cheddar. Absolutely delicious. Maybe had 2-3 layers of sweet potato at 1/8” and cooked it for 25 mins. Before adding the rest, but it was worth the effort. Delicious and pretty too. You do need a mandolin. So glad you liked this recipe, Pat! Thanks for taking the time to come back and leave a comment! This is absolutely gorgeous! I don’t eat a lot of potatoes these days, but when I do, sweet potato is my choice. 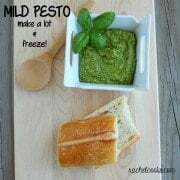 I love everything about this recipe and I love your video! I love adding sweet potato to dishes! The crust sounds yummy! Oh I’m so happy to hear that, Toni! This comment made my day! Loving the jalapeno addition! Have you ever made this in advance and re-heated? What about freezing it? I have reheated leftovers for breakfast but not the entire thing. I don’t think it would freeze well, potatoes typically don’t freeze super well and it would probably get a little watery. I hope you love it! I made a variation of this for dinner. I had to use soy instead of reg. milk but still turned out fine. I didn’t use bacon but added cooked breakfast sausage and b/c I can’t have dairy did not add cheese. It was very good!!! I realized I didn’t add as many pieces of sweet potato as recipe and next time I will be sure to add more. So good. Thanks. 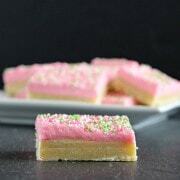 I love this recipe so so much! I have made tons of recipes for my boyfriend over the years and this is the ONE recipe he always asks for. Well done! So glad you btoh like it so much! Thanks for taking the time to come back and leave your feedback! I was a bit skeptical about the sweet potato crust (don’t get me wrong I love sweet potatoes) but my husband and I had this last night for dinner and we both decided it was a KEEPER (our slang for a meal we would eat again) Thanks for the great recipe. Oh I’m so glad to hear you liked it! It makes me so happy that it was a keeper for you guys! Thanks for taking the time to come back and let me know. That sweet potato crust looks fabulous!